Looking for the best memory cards for Sony a9? Here are the top recommended SD memory cards for Sony a9 mirrorless camera. 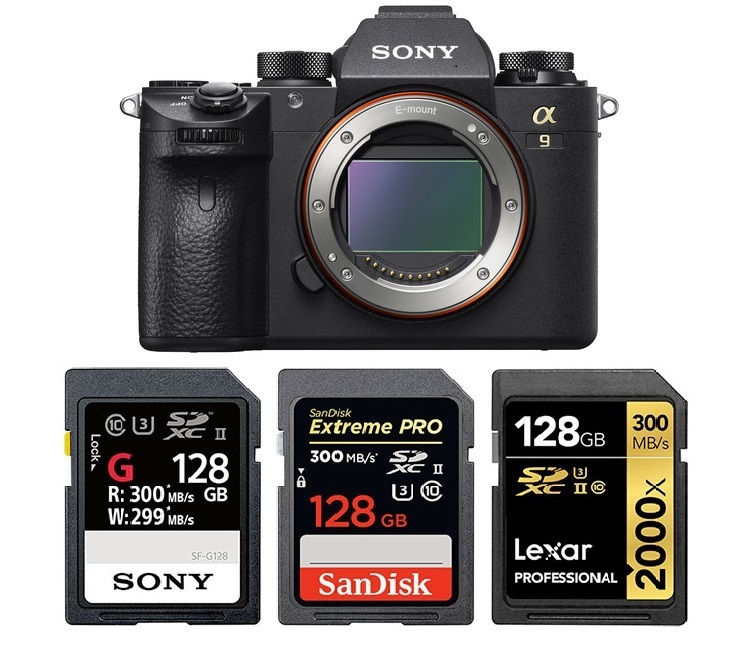 The high end Sony a9 mirrorless camera ($4,498 at Amazon, B&H, Adorama) comes with two SD memory card slots: The card slot 1 supports ultra-fast UHS-II SD memory cards while the Card Slot 2 is compatible with UHS-I memory cards. Designed for professional wedding, sports and wildlife photographers and photojournalists, the Sony a9 features the world’s first 24.2MP Full-Frame Stacked CMOS Sensor, Internal UHD 4K Video Recording, blackout-free continuous shooting at up to 20fps and so on. If you want to shoot 4K video with the Sony a9, a fast UHS-II SD memory card is a must, or you will have to wait longer for the buffer to clear and before you can start taking photos again. Below is our list of best memory cards for Sony a9 mirrorless camera. Just choose the one you like. Reminder: if you plan to shoot videos, stick to 64GB (or larger) SDXC cards for the best video codex. Ranked by write speed – Fast write speed provides fast buffer clearing time between burst shots optimizing your shooting experience. Sony SF-G UHS-II Cards are currently the world’s fastest SD memory cards boasting an ultra-fast maximum read speeds of up to 300 MB/s and maximum write speeds of up to 299 MB/s and it is well-suited for video capture. The Sony a9 Card Slot 2 is compatible with UHS-I memory cards. The Sony UHS-I SDXC Memory Card (Class 10/U3) and SanDisk Extreme PRO UHS-I SDXC Memory Card (V30) are both excellent options with the same up to 95 MB/s read speed and 90 MB/s write speed in addition to capturing 4K video. Read more: Best Lenses for Sony a9.